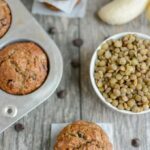 These Lentil Banana Muffins make a healthy, high-fiber breakfast or snack. They’re kid-friendly and freeze well. And I promise you can’t even taste the lentils! Add cooked lentils and oil to a food processor and process until smooth. Add mashed banana, egg, sugar and vanilla and process again. Add oats, flour, baking soda, and cinnamon and process until just mixed. Add chocolate chips and pulse a couple times to combine. Scoop into greased muffin tins and bake at 375 for 18-20 minutes or until a toothpick inserted into center comes out clean.